How would you ever be able to extract usable copper from the earth, heat it sufficiently to allow it to combine with another metal to improve its durability, then be poured into a mold of some kind, and finally shape it into a usable tool or weapon? It would seem a tricky task even today, but equipped only with Stone Age tools, we might feel it to be truly daunting. First steps involved what it took to remove copper or tin from the earth where it had formed as the earth cooled. Some authorities call this step fire setting, as a groove would be pounded into the rock along the line the miner wanted it to break on, wood laid along the groove then set burning, and after the rock was heated along the desired line, cold water would be thrown on and the rock would crack, breaking pieces away from the larger formation. Subsequently, using rock hammers again, the miners would pound the rocks into smaller and smaller pieces, continuously pounding and sorting, working till the fragments were small enough that pieces containing copper or tin ore could be identified and separated from the rest of the rock fragments. A crude and labor-intensive process, but much the same steps as mining today. At some point the miners were ready to smelt the ore and further separate or partially purify the metal they were expecting. There might also have been more than one step to arrive at the desired concentration. The finer pieces of copper-rich ore would be placed in a pit furnace lined with clay laid over the sandstone or limestone base, fired by charcoal and possibly a bellows so that the copper would reach its melting point and form droplets as it cooled. The droplets would be collected from a clay lining and re-melted in probably the same furnace so that they formed irregularly-shaped ingots, which could then be collected and moved to where the casting would be managed. Of course, these ingots were not regular in shape, and they were not regular in composition, the process never yielding anything like pure copper, but rather alloys of copper with tin, zinc, arsenic, or other metals. But that wasn’t a problem now, since the alloy would have a lower melting point than pure copper, and thus would be somewhat simpler to work with than if it was pure. For instance, a tin-bronze alloy is not too difficult to work, and melts at 950 degrees C rather than the 1084 degrees C of copper, making it easier to cast. 5-15% tin and 85-95% copper is the ratio that produces bronze that is fairly easy to work and tough enough to hold an edge better than stone, and getting tougher as it is worked with a hammer. More skilled smiths probably could detect variations in hardness or toughness in the ingots they were working with their hammers, and could then select which ones would be better for putting into tools and which ingots would be better fitted for an ornament of some kind. Because arsenic-laden copper ores were much more common than tin-laden copper ore, it is likely that early bronze-smiths would have experienced some health issues from breathing arsenic fumes over a period of time. Thus the tin-copper alloy of bronze became the material of choice, but because of their lower incidence in nature, sources of tin came to be very important to bronze smiths as they probably at some point made the connection between health issues they were experiencing and the arsenic fumes they breathed when they worked. The casting process could have been more complicated yet. Preparations had to be made. A smaller ‘furnace’ had to be constructed. 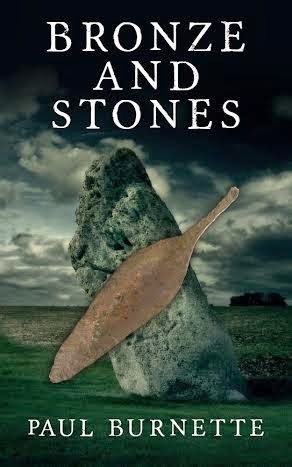 The smith would dig a hole about a foot deep and line it with stones, perhaps, then a layer of clay. This pit could be heightened and reach higher temperatures by stacking the stones and then lining the whole with the clay layer. 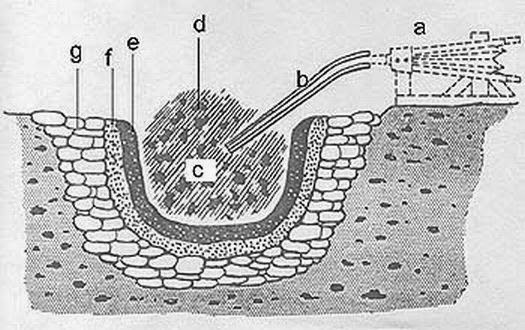 A clay tube then needed to be produced to carry the breath from the bellows into the furnace, which was held or mounted, possibly, at the mouth of the tube which needed to be several feet from the edge of the furnace to protect the bellows operator from the intense heat generated by the furnace. This is a possible situation in which one could smelt the copper ores to win the copper. 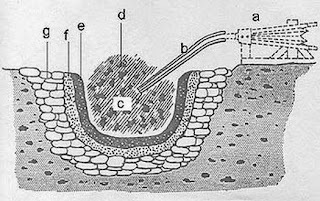 The crucible (c) would be simply a shallow, open clay container that would hold the desired amount of ingots, but would allow maximum exposure to the heat of the charcoal. Lifting the crucible out of the charcoal would possibly be accomplished with wooden tools, like a paddle, perhaps made from green wood or wood long soaked in water. The molten bronze would then be poured into a mold, the crucible and mold perhaps being held with other wooden implements of some kind. It seems reasonable that at least two – or perhaps three or four – smiths would have been required for this step. Especially since the hot metal would cool very rapidly. Of course a mold would need to be prepared before the smelting began. Molds could have been made using clay or other materials to form the shape of the desired object, say a knife blade or axe head. The smith might make a wooden outer container, hollowed out and halved, each half ready to receive half of the clay. A model object could be carved from wood and pressed it into the clay in each half of the wooden container. Then the model would be removed carefully so as to leave the shape of the model in the clay. After the clay dried, the two halves of the wooden container would then be fastened together so that the full shape of the knife or axe head would be left inside the clay inside the container. A stick would have been pressed into the center of the space so that an entry passage would be left for the metal to be poured in. So finally the molten copper-tin alloy would be poured into the mold and allowed to cool a bit before the wooden container was removed from around the clay, and then the clay would be chipped away from the cooled metal. At this point the metal could be worked in a forging process – heating, hammering, then reheating and hammering repeatedly – that would eventually produce the tool or weapon intended. It was possible, of course, that the metalworker could during this process impart any sort of decorative design to the metal that was desired. Forging step being completed, the smith would then have to affix a handle to the tang of the knife, or insert and fasten a handle to the axe head. And the process would be complete, a fairly tough, hard weapon or tool that would serve its owner more reliably, probably, than a stone tool could have. It is this process, labor intensive as it is, that the warrior-smith Aiman teaches to youngster Ulen and to others of the Ealan Clan in the novel Bronze and Stones, and it is the value of this technology that makes Aiman so important to that group of hitherto New Stone Age people that they will not allow him to return to his home, and why he becomes a man remarkable in his time for such high status and wealth among the people living near Stonehenge in the 24th Century before the Christian era. Paul Burnette has been a USAF officer, graduate student, teacher, school administrator, college teacher, and is now retired with wife Jane. They have four children and four grandchildren. He presently lives in Clemson, South Carolina, previously in Denver, Biloxi, Goldsboro (NC), Raleigh, and Athens (GA). A member of the Oconee Writers Association, he has published professional articles, two short stories, and one novel, presently working on a sequel. Wonderful descriptive detail - thank you. The careful way in which you described the process only emphasizes the amount of effort it had to have taken to get it all right and end up with a workable tool or weapon. My admiration for the earliest smiths only grows....Thank you for this thoughtful explanation.